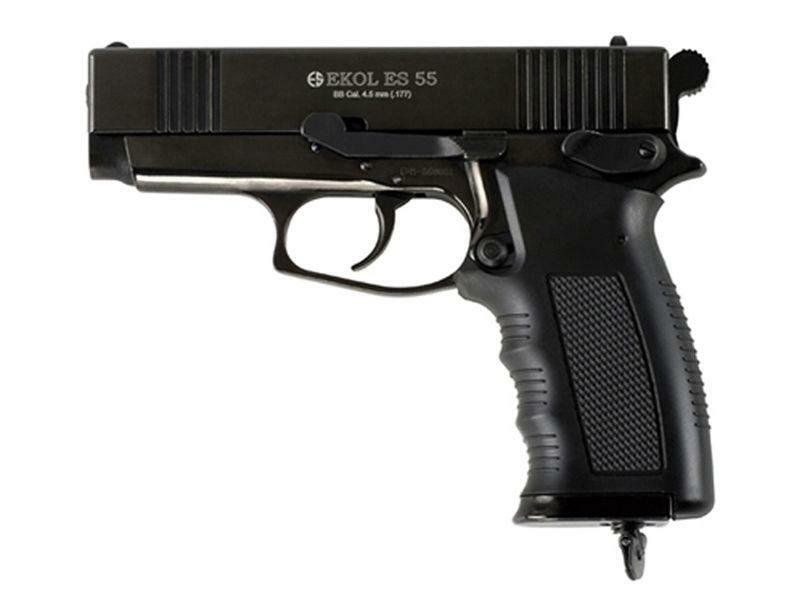 Buy Ekol Metal 4.5mm CO2 BB Pistol |ReplicaAirguns.ca | Easter Weekend Sale! Trigger Pull: The trigger pull on this gun is fairly heavy in double action mode as the hammer spring is firm. In Single action mode the trigger pull lightened up a lot and allows for respective target shooting. Accuracy: I conducted my test shooting from a target 20 feet away in a free standing position. The EKOL ES 55 gave me a respective 2 inch grouping. I think with practice, I could get this easily down to a 1 to 1.5 inch group as I was not initial comfortable shooting this gun. After shooting it for a while I did become used to the characteristics of the ES 55. Build Quality: The EKOL ES 55 comes from a company primarily making blank guns. EKOL makes this gun directly from a similar model (The EKOL Sava) that shoots blanks so in many ways the ES 55 is designed more like a real gun than an air gun. The EKOL ES 55 is all metal with rubber grips and feels fantastic in the hand. There are really no plastic parts to speak of and I could not find any quality concerns on this gun at all! The gloss black painted finish is flawless on this gun! Realism: The EKOL ES 55 is not a replica of any one gun so to speak, it looks a bit like a bunch of guns: maybe the closest one being the Glock? It does have characteristics from other guns but in terms of does this look like a real gun? Yes very much so, and when you hold it in your hand, you will find it hard to believe it’s an airgun. Very solid all metal construction! Good accuracy and excellent power combination. Full size metal drop out magazine. Designed more like a real gun than an air gun. Ejection port is moulded into the gun. Sights a bit hard to see on dark backgrounds. Slide does not move when magazine loaded into gun. Comments: This is my first ever air gun from EKOL, I have been very happy with their blank guns so it does not surprise me that their CO2 BB guns are just as nice. The EKOL ES 55 is a well-built very solid CO2 BB shooter and has excellent velocity and respectable accuracy from its rifled barrel. I found the gloss black finish to be very good on the ES 55. That combined with the rubberized grips makes this BB pistol a very attractive air gun. The EKOL ES 55 isn't the least expensive BB pistol on the block but it won't break the bank either and at the end of the day you get really good value for a gun you will hopefully own a lifetime. This thing is solid, very solid. Might even be a bit heavy for some people, but perfect for me. Feels nice in the hand.Fit and finish are OK, good but not spectacular, then again, its as good as some of my other pistols that are twice the price. It does NOT rattle and make noise like a baby toy.This gun hits like a battering ram! Probably the most powerful in my collection for this type of pistol.There is no such thing as a free lunch of course, so to get this type of power you give up blow back.The trigger is something you have to get used to..due to the feeding \ firing design, it has a very long take up, then breaks nicely. A bit heavy, but not too bad and very consistent.. Pretty cool bb pistol, nice power and accuracy fun to shoot, unfortunately it's non blow back as stated and the slide only moves with the clip out but it's power makes up for it.Overall cool looking fun little co2 bb gun! http://www.ReplicaAirguns.com - EKOL ES 55 CO2 BB Pistol Review. This is a table top review of the EKOL ES 55 CO2 BB pistol. I show you around the gun and walk you through its basic operation and handling. I have included a target example showing you a grouping I got from 20 feet out with this gun. I also show you what this gun can do to a very solid metal soup can! The EKOL ES 55 is all metal including the full size drop out magazine and is very heavy for an airgun. The EKOL ES 55 BB pistol feels more like a real gun in the hand than an air gun and has surprising velocity and penetration for a CO2 BB pistol. This is a very unique pistol to own in North America and comes at a bit higher cost compared to some lesser quality air pistols, but it is still a great value for a quality air gun.